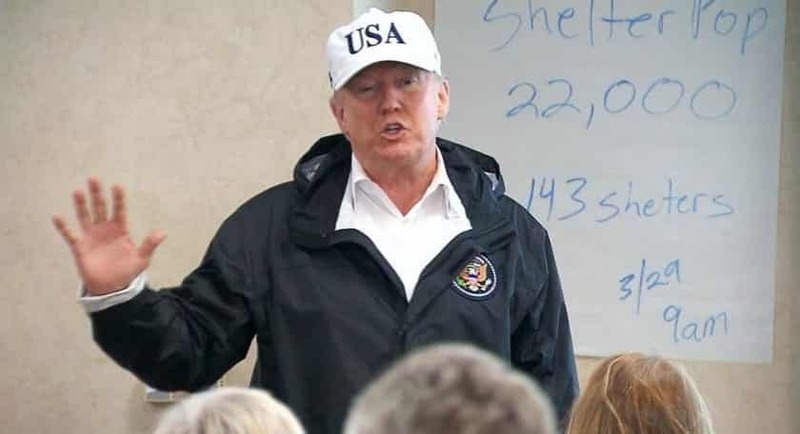 President Trump reportedly plans to request about $6 billion in emergency funding on Friday to deal with the fallout in flood-ravaged Texas. Two administration officials cited by Bloomberg late Thursday said the president is also considering tying the funding request to a measure increasing the U.S. debt limit in a bid to prevent a default. The request, which officials said could come as early as Friday, would allocate $5.5 billion to the Federal Emergency Management Agency and the rest to the Small Business Administration, according to the report. The White House expects the funding to cover demands through the end of the federal fiscal year, which falls on Sept. 30. Officials in the Trump administration have reportedly already begun talks with congressional leaders about tying the funding request to the debt limit increase, a move the White House hopes would prevent a potential deadlock over the matter. This entry was posted on September 1st 2017 at 10:04am/10:04 and is filed under Live News Column 1, Politics, Weather & Enviorment. You can follow any responses to this entry through the RSS 2.0 feed.